Channeled Music for your Ascension. For your investment of $121.11 plus shipping, you will receive the 11 songs in a 2 CD set! Oneness Becomes You™ is the Channeled Music of Archangel Ardekiel for your Ascension. The “Soul” intention of this music is to increase your individual vibration and support your spiritual growth and unfoldment of Oneness Consciousness. Prefer to DOWNLOAD the songs now? Downloads are available for the entire Oneness Becomes You™ ~ “Magnum Opus” Collection or Individual songs at www.onenessbecomesyou.com. Known as “The Intuitive Spiritual AND Wealth Coach,” Deborah “Atianne” Wilson inspires her international audiences and clientele to understand that it’s truly OK to be Spiritual AND Wealthy. 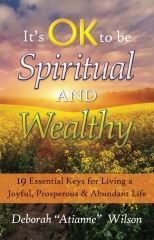 Too often people keep spirituality and wealth separate, but Deborah reminds us of our Divine inheritance, teaching that our freedom comes from truly embodying both Spirituality and Wealth as One Essence. SUMMER 2015: We’re giving Deborah’s Trust Your Heart program a visual facelift! 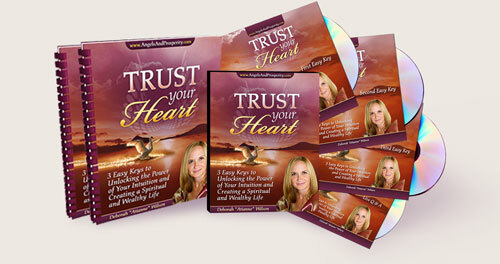 While supplies last, you may invest in this Trust Your Heart program for only $97!!! For your investment of $497 $97 through Summer 2015, you will receive the FOUR audio recordings on CDs, the physical Transcripts AND an Action Guide & Journal to keep you motivated for an additional 45 days! This program is foundational. The 3 Easy Keys to Unlocking the Power of Your Intuition and Creating a Spiritual AND Wealthy Life are essential to creating the life you want even if you are unsure of what you want or which direction to take in your life. This program will help you take your life to the next level so that you clearly receive signs that confirm that you are hearing your intuitive voice clearly and accurately. 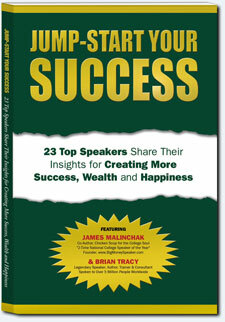 Deborah Wilson and 22 other Top Speakers Share Their Insights for Creating More Success, Wealth and Happiness. Featuring James Malinchak, Co-Author of Chicken Soup for the College Soul, and Brian Tracy, Legendary Speaker, Author, Trainer & Consultant.